The TC range has been developed give Valve Amplifier designs a new level of responsiveness. Manufactured from polypropylene film, precisely metallised with a unique pattern that greatly enhances self healing, these capacitors offer a dramatic performance improvement over electrolytic types. The TC capacitor's equivalent series resistance (ESR) and inductance are a fraction of that of an electrolytic, and therefore instantly deliver all their power precisely when it is needed. The dry construction additionally ensures that the performance is retained through out the expected lifetime of the amplifier. In electrolytic capacitors evaporation of the electrolyte reduces capacitance and increases ESR dramatically during the lifetime leading to performance degradation. In professional equipment, frequently shipped in unpressurised aircraft holds, this process is accelerated. The 700Vdc rating eliminates any requirement for complex series connection of multiple capacitors. In addition the TC range are un-polarised making assembly simpler and less error prone. An optional M8 / M12 base stud offers a robust reliable mechanical mounting method if required. 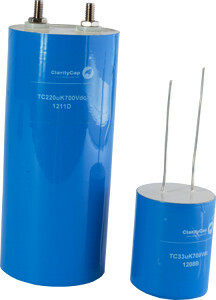 TC capacitors are additionally available in 900V, 1100V, 1400V and 1800V should higher voltage ratings be required.